Congratulations to the Buckles & Bling 4-H Club from Lancaster County for being selected as your June 2012 Nebraska 4-H Club of the Month! Lincoln, NE – June 28th, 2013- The Buckles & Bling 4-H club should be club of the month because its 6 members are proud Equestrians. They always find plenty of TLC time with their horses even with busy schedules. Even with band trips, boy scouts, church camp, and many other activities all the members care for their horses with love and diligence. Some of their horses have had serious injuries of life-threatening events. The members of Buckles & Bling have trained themselves and their horses, and rehabilitated after injuries to become better riders and help their horses to become better alongside them. One lucky time was when a family was in a car accident with their horse trailer. Luckily, no horses were in the trailer at the time and all the people were also safe. Through hardships and tight schedules the members of Buckles & Bling have come together to help each other and their horses, that is why the 4-H Ambassadors believe Buckles and Bling 4-H Club should be the Club of the Month. The Nebraska 4-H Foundation and Nebraska 4-H Ambassadors are proud to call the Buckles & Bling 4-H Club of the Month for June 2013. Also, applications are being accepted for the July 4-H Club of the Month until Friday, July 12th. Be sure to inform your clubs about this opportunity to be acknowledged for their achievements, service projects, and awards! Winners will receive a $50 check from the Nebraska 4-H Foundation and will be recognized state wide! 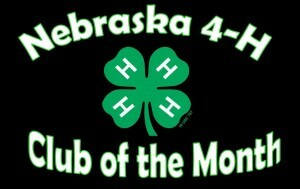 Applications can be found athttp://www.ne4hfoundation.org/resources/4-h-club-of-the-month . No Comments to "Buckles & Bling – Club of the Month"